This example, which is a continuation of Example 4.31, demonstrates techniques for estimating the shape, location, and scale parameters, and the theoretical percentiles for a two-parameter lognormal distribution. 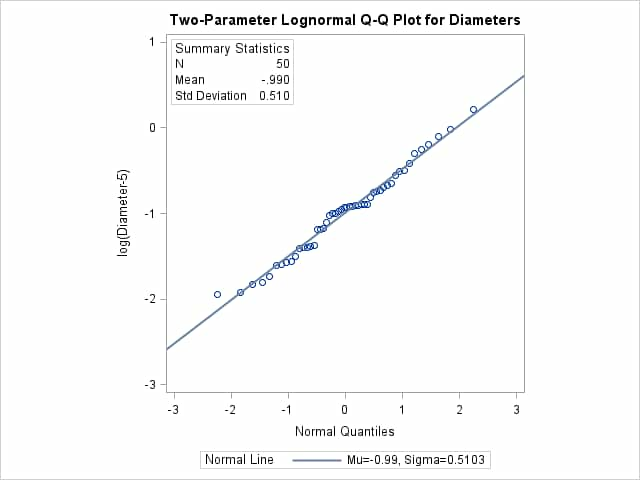 Because the point pattern in Output 4.33.1 is linear, you can estimate the lognormal parameters and as the normal plot estimates of and , which are –0.99 and 0.51. These values correspond to the previous estimates of –0.92 for and 0.5 for from Example 4.31. A sample program for this example, uniex18.sas, is available in the SAS Sample Library for Base SAS software.